Patholi is a delicacy in Konkan and Goan Communities. Konkani, Goan and Kerala people use coconut in almost all their food preparation. These places are located at coastal regions where coconut is grown in abundance. This is prepared without jackfruit too. My maternal Uncle loved to have this with ghee on top and dip it into honey. I love it with honey too! Recently I wrote a brief note on upvasa khana. This recipe is my first contribution to that new section. I prepared this dosa last month on Ekadashi day. This is a simple dosa to prepare as the batter does not need fermenting. Serve it with butter or homemade fresh "loni" with any simple chutney. Happy Gowri Ganapathi to all my readers! 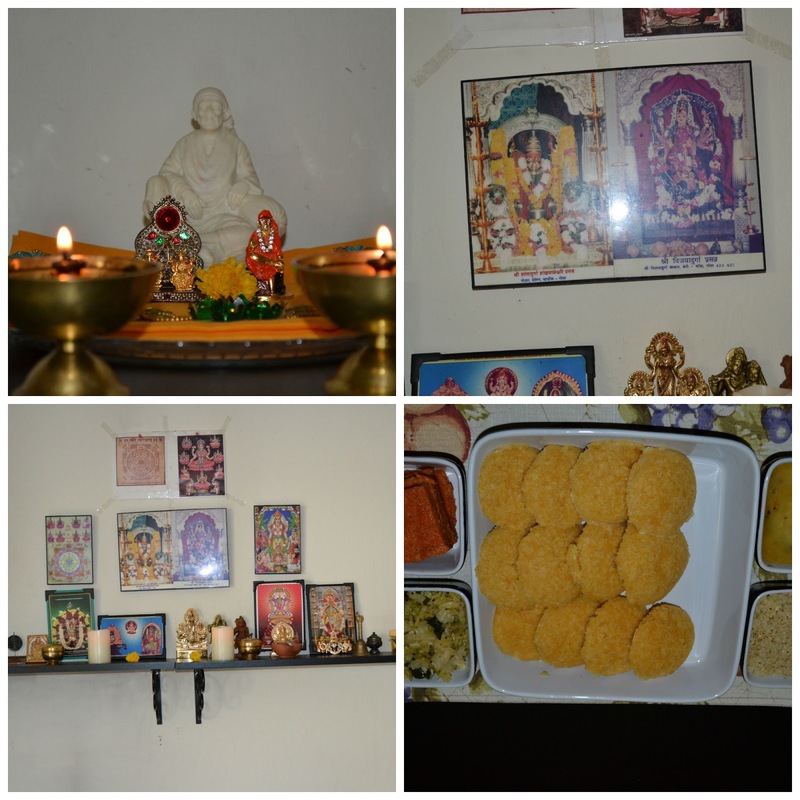 We dont have the tradition of Gowri/Ganapathi at my in-laws. We of course celebrate it but the tradition of vaina (gowri) and getting ganapathi home is not followed. But my maternal grandmother's house still follows both the days. They observe Gowri at home and Ganapathi with family as a whole in one of the konkani temple in Thirthahalli. I enjoyed both the days all my childhood. Buying new glass bangles for Gowri was so exciting. But unfortunately never tried to jot down about the steps or take any pictures. Thanks to Whatsapp by uncle shared few pictures this time. Adgai is a pickle prepared with young jackfruit or green jackfruit. We call green jackfruit as Kadgi in Konkani. There are many dishes which we make with young jackfruit like kadgi uppat, kadgi phodi, kadgi upkari, kadgi chakko etc. Out of all chakko is yummylicious ! Adgai is unlike other traditional pickle. Adgai does not have a very long shelf life. Though there is no coconut used in it it wont last longer than 2-3 weeks only if refrigerated. The initial step to make this pickle to boil raw mangoes and green jackfruit in boiling water. I am assuming the water content is what makes the shelf life shorter. However this is a very tasty pickle and our friends really loved it. Goes very well sheeth, dalithoy or even panna polo. Though raw mango definitely adds flavor I have made it without mangoes when mangoes are not in season. The key is to put right amount of spices and also frying it without letting it burn. The only pickle I prepared so far is adgai :-)...the other two were raw mango and also lime but I just bought the ready powder and mixed it according to steps mentioned. So I really wont say i have made pickles at home ! This year we have been very regular in buying fresh jackfruit from Ranch. They were very sweet and fresh. My husband being a very big fan of jackfruit we totally relish it every time we get it. For Sutta Punav I had to make something for dessert and I decided to go with Ponasa Muddo. I have prepared these before but when I was new to this place I was not aware Ranch carries fresh jackfruits in season. I always got canned ones. Though it came out very well the taste we get when we make with fresh ones is different. With the same batter we can make mulik. Mulik is a deep fried version. But because we like muddo more I make it more often than mulik. Because I do not have the traditional pedavena, I steam these in my idly cooker. Except for the shape there was no difference. Sutta Punav one of the very important and auspicious day for Konkani Community is on August 29 2015. On this day all the men at home who have had Brahmopadesham (thread ceremony) will have to change their thread and wear a new one. 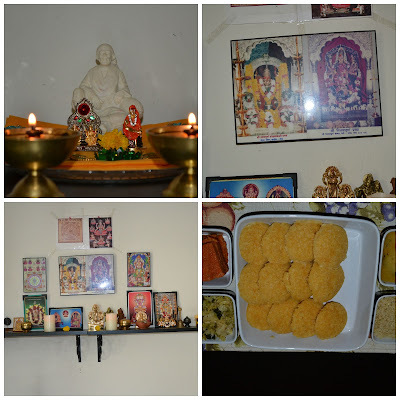 This can be done at temple or even at home in front of family deity. It is a renewal of sacred thread and the thread is called Jannuve in Konkani. Usually unmarried men wear one with three threads in it and married men wear two with three threads in each. I recently learnt one is for wife. I was surprised to read in ancient days even women wore it and did sandhya rites. I am not sure why women had to stop this practice. This needs to be worn on left shoulder which hangs towards right.